You probably know Nicki’s for all the wonderful cloth diapers, breastfeeding and baby wearing products that we carry. You might not know about some of the other products that we carry, like toys! We have a wonderful selection of toys for your infant, toddler, and big brother or sister! If you’re looking for a great shower or new baby gift for someone, you can’t go wrong with a Vulli Sophie the Giraffe or Chan Pie Gnon. These soft, squeaky toys are made with all-natural rubber and food grade paint so you can feel safe letting baby chomp away. They are easy to grasp and easy to wash! 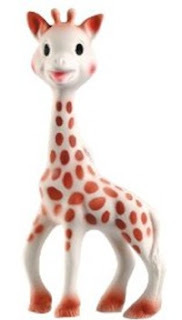 Sophie the Giraffe is a favorite with a baby cutting teeth, as the long, skinny legs are easy enough to get back near molars but don’t post a choking risk. Vulli also makes vanilla scented rings that are soft and easy for little fingers to keep hold of. 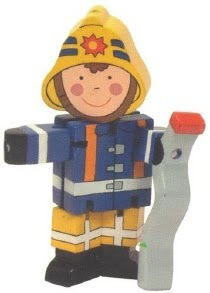 If you’re looking for a wooden toy, The Toy Workshop’s Flexi Characters come in a variety of creatures including pirates, clowns, doctors, and firemen. These characters have a moveable head arms and legs and encourage a child’s imagination! For the younger ones, iPlay wooden rattles are made of 100% natural, sustainable wood and are completely safe for baby to chew on! Under the Nile makes some of the cutest, softest toys you’ve ever seen! These soft toys are made from 100% organic cotton, even the filling is organic! You’ll find them in the shape of fruits and veggies, a variety of animals, soft sleeping dolls, bugs, and teething rings. If you’re looking for a great gift for a big brother or sister, we have a few things that would be perfect for them! Give them their own personal carrier (Hotsling, Moby or Ergo!) to carry their baby dolls in, just like mom carries their baby sibling! Encourage them use a cloth diaper their dolls with Happy Heiny’s doll diapers in a variety of colors and patterns. 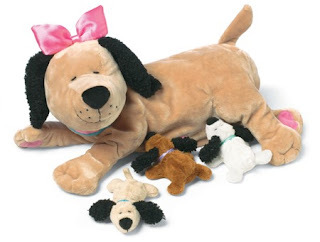 One of my personal favorite toys at Nicki’s are the Manhattan Toys Nursing Pets! Let Nursing Nina the Cat, Nana the Dog or Nuna the Pig help your child understand breastfeeding. These pets each come with 3 babies that “nurse” and attach to their mama by magnets. Make sure to check out the Toys section on our website for a variety of other fun products at Nicki’s! 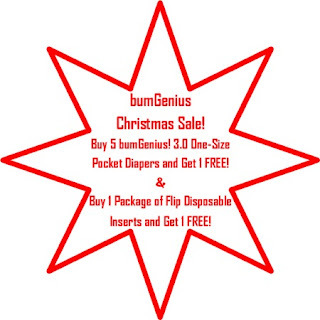 Take advantage of this sale and stock up on the popular bumGenius 3.0 Pocket Diapers and the new Flip disposable inserts! WIN a 2-pack of Sensible Lines Milk Trays!! Sensible Lines has come up with something you can really use! Their Milk Trays allow you to freeze your milk in one-ounce sticks in convenient, stackable trays. Just freeze a tray and then transfer your milk sticks to a plastic bag. What a space saver! Since the milk is already frozen when put the sticks into the plastic bag, it is safe to use any freezer-safe zip lock bag or container. Sensible Lines Milk Tray also eliminates waste because you can use your milk 1 ounce at a time. No more thawing 6 ounces when you only need two! Really convenient when only 1 ounce is needed for baby's cereal. So now you can take advantage of every ounce of milk in a safe and practical way. Sensible Lines Milk Tray was awarded the 2009 iParenting Media Award for Outstanding Product! It was invented for moms, by moms who know the value of breastmilk. Sensible Lines Milk Trays are eco-friendly, BPA and dye free, and 100% recyclable. They are made from PETG plastic, a FDA-approved medical-grade plastic and meets the highest standards in plastic. Frozen cubes are easily removed from the flexible tray and are perfectly shaped to fit into any baby bottle. Sensible Lines Milk Trays come with fitted lids that block out freezer burn and odor from the freezer. They have a slim, space saving design. They can also be used to freeze puree for baby, popsicles for kids and even as an ice cube tray. Each Sensible Lines Milk Tray set comes with 2 trays and 2 lids. To enter to win your free 2-pack of Sensible Lines Milk Trays you will receive ONE entry for EACH option below (you MUST leave a comment for each option saying what you did and where). This means you can get multiple entries increasing your chance to WIN! (each "Weekly Giveaway" may be different): 1. Become a subscriber of Nicki's Diapers Blog or if you already are post it 2. Become a Fan of Nicki's Diapers Facebook page 3. Post a comment on Facebook about Nicki's Diapers including a link to any page on Nicki's Diapers 4. Follow nickisdiapers on Twitter 5. Tweet about Nicki's Diapers including a link to any page on Nicki's Diapers 6. Blog about Nicki's Diapers including a link to any page on Nicki's Diapers 7. Talk about Nicki's Diapers on a Forum including a link to any page on Nicki's Diapers COUNTS AS DOUBLE ENTRY!! 8. Grab one of our buttons and put it on your blog. 9. What is your favorite positive breastfeeding story. *Contest ends Jan. 7th at midnight and winners will be posted the next week. Winners generated by random.org Winners must notify nicki@nickisdiapers.com within 1 week. Congrats to the winner of our 12th weekly giveaway! jennifer wins a Blueberry Coverall One Size Diaper Cover!! Thirsties Duo Wraps!! This week only $11.25 with FREE SHIPPING!! All "Items of the Week" run from Wed to Wed. Wed is DOUBLE DEAL DAY!! When my second son, Sean, was born, I was already well aware that one newborn essential was a good swaddling blanket. Little did I know that it would be a lifesaver. Sean’s first two weeks were spent sleeping all hours. Then, like a light switch at the 2 week mark, the screaming began. It was all too familiar to us and we knew right away what was wrong. Like my first son, Ian, Sean has a milk protein allergy. I immediately eliminated all dairy from my diet, but unfortunately it takes 2 weeks to entirely work its way from my system and another 2 weeks to get out of his. In the mean time, we were left to deal with a baby that could not be comforted in any way, except to be swaddled. Not only did Sean spend his naps and night swaddled, for those 2-3 weeks that he was still working the dairy out of his system, he spend the majority of his waking hours swaddled as well. It made him feel warm and secure and minimized the amount he cried. Most people won’t have to use swaddling for such an extreme situation, but it’s nice to know just how effective it really is. There are three main benefits to swaddling your baby. Babies sleep longer- Because baby is used to being curled up tight and warm in the womb, swaddling mimics this feeling and allows them to relax and feel more secure. Also, babies are born with a Moro reflex that can cause them to startle themselves awake. Being wrapped tightly minimizes that built-in reflex. Fewer scratches- When baby is born, they will likely have long, papery nails that can have sharp edges. Because their movements are jerky and uncontrolled, they will likely scratch their face. Swaddling keeps those arms and hands in nice and tight, preventing those not-so-pretty scratches. Less crying- As previously mentioned, babies have a built-in startle reflex. The flailing of their arms and legs can scare them, causing them to cry. By keeping their arms and legs tightly wrapped, less crying results! Our favorite swaddling blanket for Sean was the Snug & Tug. It’s a blanket made specifically for swaddling that features a large pouch that your baby can’t kick out of, and velcro closure to ensure that no amount of wiggling can undo the swaddle. The blanket comes in two sizes and 6 colors. We found that we needed to have at least 2 of these so that there was always a clean one. We did NOT want to have to go a night without one! Some other fabulous swaddling blankets that we have at Nicki’s are the Aden & Anais muslin wraps and the Moby swaddling blanket. The Aden & Anais blankets come in a 2-pack or a 4-pack. They are super soft, lightweight (yet nice and warm!) and come in a variety of colorful patterns. They are very generously sized and can therefore be used for many other things, such a play blanket on the floor, a burp cloth, or a cover while nursing. 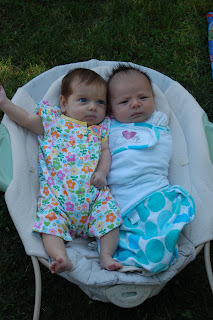 The Moby swaddling blankets are made of stretchy, 100% cotton in a variety of colors. They have plenty of fabric to get a nice, tight swaddle. Each blanket comes with a matching hat for your newborn and a matching drawstring storage bag. 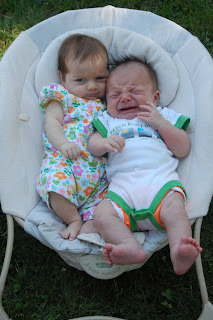 Here is my poor little Sean at a play date with Corey’s daughter, Gretchen. What a difference the swaddle made! You can find these new products at Nicki’s! More products arriving weekly so keep checking back! Baby Bella Maya Booties This week only $8.99 with FREE SHIPPING!! One of the most common questions is “What do I do with poopy diapers?” Wet diapers or exclusively breast fed bowel movements can go directly in the wash. When starting cereal or purees however, BM’s need to be disposed of before washing.. There are a couple of options. I’m sure one of them can work for you. At Soren’s 4mon check up our pediatrician gave the ok to start solids. I had been dreading the day I wouldn’t be able to toss his diapers all in the wash anymore. Now his BM diapers are no longer water soluble and need to be rinsed off first. It’s really not so bad and is actually quite easy with a diaper sprayer. Nicki’s sells 3 different brands; bumGenius, Mini Shower, and Sigma diaper sprayers. These all hook up to your toilet and are super easy to use. You can even adjust the water pressure to your preference. No biggie! After I had rinsed his diaper thoroughly, I didn’t know what to do with a dripping diaper. I wanted an easy place to put it until I was ready to do the wash. We have a very small bathroom so adding a diaper pail in there wasn’t really an option. The solution came when I heard about hanging wet bags. What a great idea! I thought I can just hang one in the bathroom on the other side of the toilet and it is right there. No more dripping diapers across my bathroom to my diaper pail. My favorites are the Planet Wise hanging wet/dry bags. They are so cute and you can chose a color or pattern to coordinate with your bathrom decor. They have many uses, too! We use them for other things like wet swimsuits and towels in the summer. If rinsing isn’t your thing, Nicki’s also has flushable diaper liners. Talk about ingenious and easy to use. There are several different brands at Nicki's; Imse Vimse Flushable Liners, Bummis Biosoft liners and Motherease biodegradable liners. The Imse Vimse and Bummis brand come in two sizes while the Motherease can be folded to fit different sized diapers. These go between your baby and their diaper and catch any solid waste. Then just flush away the mess. These are great for road trips or when you’re going to be out of the house. No matter which you choose, the diaper sprayer or the liners, it’s really at lot easier than people think! The Blueberry Coverall is an economical and functional one size diaper cover that can be used for the majority of your child's diapering years. If you have more than one baby in diapers, you won't need to buy different sizes for each baby! The Blueberry Coverall works great with prefold, flat, fitted and contoured diapers! $16.97 and Free Shipping for all diaper covers! To enter to win your free Blueberry Coverall One Size Diaper Cover you will receive ONE entry for EACH option below (you MUST leave a comment for each option saying what you did and where). This means you can get multiple entries increasing your chance to WIN! (each "Weekly Giveaway" may be different): 1. Become a subscriber of Nicki's Diapers Blog or if you already are post it 2. Become a Fan of Nicki's Diapers Facebook page 3. Post a comment on Facebook about Nicki's Diapers including a link to any page on Nicki's Diapers 4. Follow nickisdiapers on Twitter 5. Tweet about Nicki's Diapers including a link to any page on Nicki's Diapers 6. Blog about Nicki's Diapers including a link to any page on Nicki's Diapers 7. Talk about Nicki's Diapers on a Forum including a link to any page on Nicki's Diapers COUNTS AS DOUBLE ENTRY!! 8. Grab one of our buttons and put it on your blog. 9. What is your favorite color. *Contest ends Dec 24th at midnight and winners will be posted the next week. Winners generated by random.org Winners must notify nicki@nickisdiapers.com within 1 week. Mommy's Touch One Size Pocket Diaper!! This week only $15.49 with FREE SHIPPING! !